Hair: Silver, straight and long, reaching below the waist. It was kept out of her face with a silver headpiece. Life history: Sefra was a Firstcomer and member of the Circle of Nine. Her purpose was to keep time, so the Firscomers would know when to go somewhere. It was Sefra who pointed out to the other Firstcomers that they had arrived at the World of Two Moons too early, and who remarked that she wasn't sure whether they would be able to fly the Palace again if they managed to go back to it, because her powers were a lot weaker in this world. 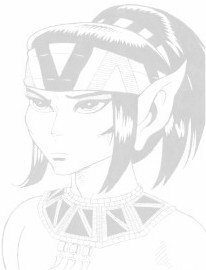 Sefra's habit of looking at the stars to know things, as well as her looks, make her a likely candidate to be one of Skywise's ancestors, though nothing has been stated for certain on the matter. It is unknown how she died.